Following a 'sickness' which sweeps the nation, beginning with 'silver blisters' and ending in memory loss, Joy is confined to a hospital purportedly looking to find a cure amongst the patients. In a world which has become desperate to remember, Joy is a woman who has spending a long time trying to forget her own life. I thought the first half of the book was more interesting than Joy's journey away from the hospital, and whilst it erred on the side of YA (not a bad thing, but not what I was looking for), it was an enjoyable and thought provoking read about what we choose to remember and what we choose to forget. One of Wyndham's most famous novels and a stalwart of the post-apocalyptic genre, The Day of the Triffids is one of my favourite reads this year. After reading a fair few widespread-disease-world-breakdown types of novels in my post-apocalyptic and dystopian binges, I found myself a little exhausted of them - but I found the unusual combination of world-wide blindness and killer plants compelling. It's an interesting and imaginative exploration of the many ways people will cope with disaster, if a little 'cosy catastrophe' for some tastes (and a product of its time). Everyone knows the Will Smith film, everyone's cried when the dog dies. For those who haven't read it though: it's very different to the film, and that's actually a good thing. Normally, I'm pretty vampire-averse; it's just not a subgenre which excites me. However, I was surprised how much I enjoyed this book, and how I really felt I could see the world which Matheson built (and not in a cheesy Twilight-tinged way). It really built up the 'righteous destroyer' narrative and flipped it on its head (though perhaps not unexpectedly), but most of all it was the portrayal of loneliness and isolation which hit the right note for me. The third book in this round of reading which was published in the 1950s, On the Beach deals with the aftermath of WW3. 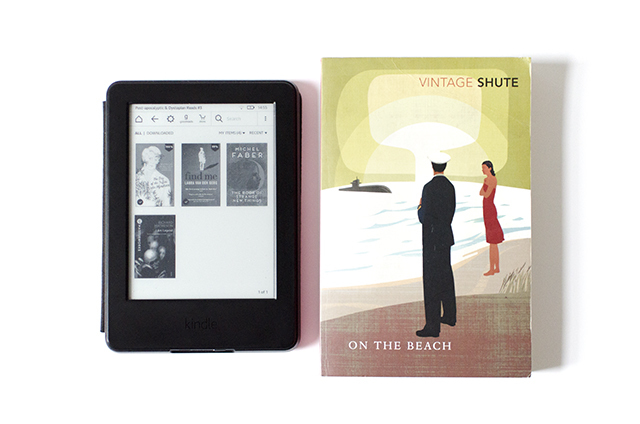 It's saddening that Shute was imagining the next disaster, only just over a decade since the end of World War Two. Nuclear war has devastated the planet, and survivors in Southern Australia - prepared with suicide pills - are living in wait for the global air currents to finally carry the radiation their way. It's one of my favourite books, not just in the post-apocalyptic genre - a masterclass in the ways people deal with an unseen, inevitable tragedy. Just don't expect anything other than bleak! This novel is totally different from most of the other books I've read in the genre; Peter departs from England to become a missionary to aliens on a distant planet, working for a corporation which depends on the planet's inhabitants to produce food. Back home, his wife lives in a world progressively more unstable; Peter experiences the seemingly apocalyptic events on Earth indirectly through her messages. In The Book of Strange New Things, Faber captured a lot of my feeling regarding the colonialist and exploitative tradition of mission work, as well as creating a surprisingly unnerving post-apocalyptic world despite barely delving into 'disaster' territory.